Spot silver prices followed much the same pattern as for the spot gold price yesterday, ending the silver trading session with a narrow body candle, but one with a deep lower shadow to the downside, which seemed to find some support from the 14 day moving average, suggesting that we may see spot silver prices rise today as a result. 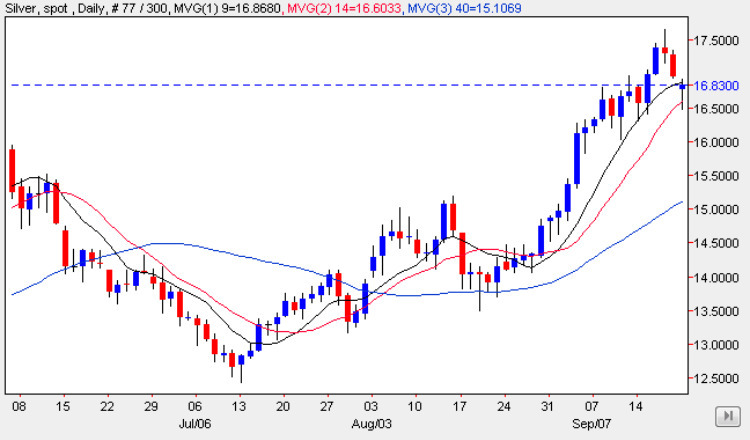 In addition, the support level in the $16.50 per ounce region, also seems to be providing solid support, and given these two factors, would indicate from a technical point of view that the bullish momentum remains intact for the spot silver market. Nevertheless, we still have the deep resistance area above, which is spread over a $2 per ounce region, and which will take considerable momentum to penetrate, but with all the markets now waiting nervously for the conclusion of the two day FED meeting which starts today and ends tomorrow with the rate statemenent and announcement, this could provide the trigger for a move higher in the short term. Technically the spot silver chart remains bullish, and with yesterday’s candle adding weight to this view, we should see a run higher to re-test the $17.50 per ounce level in the short term, and provided the FED statement contains few surprises, then we may see a deeper push into the solid resistance outlined above in the medium term.